Wish I could be of some help. Solid idea though, good luck with finishing it. Hope it turns out to be useful. They should just get one person in every decent sized town to put up a proper geiger counter and have it tweet the measurements every 10 to 15 minutes. Preferably set up on a stable hill with backup power and wifi or radio bursts copying the output too when internet is out, if need be using morse code. http://www.oism.org/nwss/s73p938.htm is the appendix which has the actual ‘how to build’ portion. essentially a geiger counter is an spark gap with a strong potential difference between the containing wall and the central electrode. the volume is filled with a gas with a cross section of interaction for ionizing particles. when an ionizing radiation splits a given molecule of gas the newly created charged particle pair and are split by the potential difference in the detector and fly towards their respective electrodes. the current generated by the moving charged particles is incredibly small, but measurable. short of growing your own CCDs or adapting units available on the market this is the only method I know of to detect radiation reliably. the main road blocks I can see in getting a decent open source detector would be ensuring the seal’s integrity (there doesn’t have to be a pressure difference, just a known gas), acquiring the selected gas, and most importantly calibration. I don’t know many people who keep known and dated radiation sources on hand. sparkfun has something that could be useful for some inspiration. I’m not sure if many people on hack-a-day know about this website but they sell surplus components for cheap. And oh look, they happen to have Geiger counter kits on sale…. Andrew> couldn’t someone use a smoke detector as a crude radiation detector, then ? Interestingly enough, it may be possible to use the ionization chamber from a smoke detector for this one. The only real modification would be removal of the radio isotope, so that you would be able to detect ionization rather than the neutralization of said ionization due to smoke. for cost efficiency, it would be best to use a resistor/led ladder for your display. The only downside to the devices is the requirement of high voltage to detect the ionization. This is murder on batteries. Components for a radiation detector typically include a HV supply, preamp, shaping amp, and comparator (1MHz or better) depending on the detector because radiation events are much faster than the common audio signals. HV can be a simple C-W ladder with a HV filter at the end. Bias of course depends on the detector and how it is applied also. A G-M tube applies bias to the central wire and grounds the outer tube. When a pulse event occurs, the G-M enters a breakdown region where as the ion pairs move toward the respective cathode/anode, a multiplicative effect occurs, causing one large pulse that signifies paralysis of the detector. The pulse leaving the detector needs to be processed by a current sensitive preamplifier, which then needs to output a voltage pulse. An amplifier will then shape and increase the amplitude of the signal so that it will be able to trigger an event in a comparator. A counter then adds the events to a buffer, which can be coupled with a timer to give rate information. Lastly, a display then shows the count rate information either through some bouncing needle meter or some other output means. Calibration will require a radiation source. Cs-137 is the standard calibration source and is available in NRC exempt quantities of 1uCi to 10uCi from Spectrum Techniques in Oak Ridge, TN. There are several IEEE standards pertaining to the calibration and testing (N323 is one of them I think and there are an entire series of these). a DIY rad-hardened Geiger counter? Sounds awesome. About homebrew geigercounters, would it be possible to replace the hard to get vacuum chamber with something more managable? What about an reverse biased large area diode? Like a monocrystalline solar cell? Make it completely dark, then detecting the small pulses of leakage in the PN junction? Every charged particle that would travel trough it would create a small jump in leakage, this could be detected by a high impedance low noise amplifier like a JFET input opamp or a BF862 based amplifier? Problem with such a setup would be to shield it from light but not from radiation. Alpha and beta particles are easely stopped so it would mostly detect gamma radiation. Anybody has any pitchblende uranium ore in their mineral collection to test it out? I think an americium based smoke detector would do it too. Remove the small gold matrix that encapsulates the source. I found this circuit using a PIN photodiode. A good sensitive diode would be the BPW34, it is cheap and easy to get. I’m amazed no one even looked/remarked on the kearny fallout meter – which is a circa 1970’s homebrew meter that was tested in a lab to be VERY PRECISE. @Necromant Wow, that’s awesome work that Russia guy did!!! I agree with the posters pushing The Kearny Fallout Meter — considering what it is made of, it really fits in on HaD well. But if you insist, project #103 of this book: http://www.amazon.com/103-simple-transistor-projects-Kneitel/dp/B0007DWA6M . I’m sure it can be made with modern parts and smaller batteries. It’s exactly what I was thinking. But why would you need pitchblende. If it works, you should get the 15-20 counts every minute from the background radiation. You could use an black cd-pen or something like this to cover the diode. I’m pretty sure it’ll work. On a related note my geiger counter is on twitter at twitter.com/geiger93933. In marina, california. 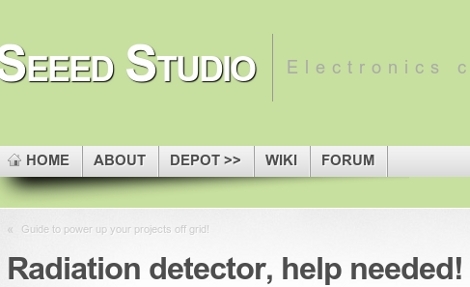 “Sensors for the Evil Genius” has a number of radiation detection sensors. Most for indoor use, but certainly a starting point. bpw34 will not work. γ radiation is in the pico-meter wavelength range, the spec sheet suggests that bpw34 is good for 1100-430nm. That is an order of magnitude larger. It’s even useless for x-ray radiation with is in 10-0.01nm range. No one’s going to fall for that. There’s no way you can make a radiation detector without a microcontroller and some sort of digital readout! Your hoax was just too obvious this time… Next time, aim just beyond the edge of plausibility! Radiation detection is no trivial matter. What kind of radiation we trying to detect? I’m guessing that there is the implicit assumption that only ionizing radiation is of interest from a health perspective. The Geiger Tube is really the most robust gamma ray detector. There should be some way to build a low-voltage/solid-state Geiger counter. This site shows how to build a geiger-muller-counting-tube and circuit to create a complete geiger-muller-counter. This site is full of tube projects. Looks like the author is some engineer of the old school. @pheo, zener diode you’re referring to seems to be the SiGe Pin diode. do you have a source for those in the correct wavelength range? I think photodiodes would not directly absorb the photons to convert into a photoelectric current. But you could measure the ionising path the ray/particle makes trough the junction, seeing a jump in the junction leakage current. That is what the maxim application note tries, and also shows the tradeoff you need to make of noise vs sensitivity. @Beavis1975 well… you could always wire up a mcdonalds free pedometer to show how many times your hands shook in a dosing. Maybe some neon lamps, some stickers, a PIC or two later and you’re ready to market it on newegg. I will say I have an unused circa 1969 victoreen civil defense geiger counter (bought cheap!) and it comes with a full wiring diagram so I’m sure its easily reproducible. Even the ‘detection chamber’ is really similar to the KFM. There’s a fair amount of homebrew Geiger counters out there the last time I checked. Using a Geiger tube, it’s pretty simple really – as Jeff noted. I believe I read somewhere some guy tried using a neon tube in a similar matter to a Geiger tube. Can’t remember where though. I’d stick with the Geiger counter concept as that is the only reasonably doable approach – scintillation counters require scintillators (a fair amount of materials can be used, even water will do, though don’t expect too good results) and expensive photomultipliers, or twice as exotic adn quite expensive and not half as sensitive special photodiodes – unless the radiation levels are extremely high, you get only VERY LOW light levels (as soon as the scintilation is visible to the naked eye, you’re not running fast enough). Then there are the more exotic ones, like HPGe and that sort of stuff – insanely expensive, big, cryocooled and for lab use only. And there are other smaller designs like http://www.amptek.com/oem.html which cost quad their weight in gold and mithril. So, the Geiger tube approach is the best and cheapest. you could try and use a piece of x-ray intensifier film carefully placed downwards onto a ccd chip. a related hack is to use the bare CMOS sensor from an optical mouse, some of the older ones let you read the raw values from the registers on the chip. Am I the only one who saw that headline and wondered wtf a German reggae band was doing on hack-a-day? There’s guy on twitter who is using his sparkfun geiger counter to send hourly tweets, based out of California. It’s mounted on his roof sending data via Xbee. While the news is reporting an increase is radiation levels his counts have not gone up. You can find those pen dosimeters used by medical personal or army cheap at surplus shops or sometimes on ebay, i have seen them for under 5$ each, maybe you could get hands on a batch of them for cheaper if you ask the right institution. here is another german page, the guy describes his long way to build a working geiger tube. Hack a photomultiplier tube from an old, old video camera? A system based on a Geiger Mueller tube would be the cheapest to purchase, easiest to design around, and simplest to calibrate. Start with an oscillator that feeds a regulated voltage multiplication network (diodes and caps), attach to GM anode, ground the cathode, couple the signal to a charge sensitive amp that triggers a multivibrator, and integrate for indication. Connect some sort of variable frequency input (preferably a pulse with similar width as the dead time of the GM tube you're using). "scintillation counters require scintillators (a fair amount of materials can be used, even water will do, though don’t expect too good results) and expensive photomultipliers, or twice as exotic adn quite expensive and not half as sensitive special photodiodes – unless the radiation levels are extremely high, you get only VERY LOW light levels (as soon as the scintillation is visible to the naked eye, you’re not running fast enough)." – To compare a photo multiplier tube to a photodiode and declare the diode as the more sensitive or better suited for this particular application is silly at best. You either have no idea as to to how either of them function or you've experimented with both and failed to consider "basic rules of thumb", for one or the other. The PMT will always be able to see light that you cannot. Scintillation/PMT detection circuitry is, as far as I know, the best (most efficient and expensive)way to detect ionizing-radiation. "The Geiger Tube is really the most robust gamma ray detector. It’s basically a big gas scintillation cavity, but it requires high voltage (so it’s “too dangerous” for the kids"
1st, I could be wrong, But I've never heard of a detector that can reliably detect ionizing radiation with a "low voltage". 2nd a geiger mueller tube is not a "big gas scintillation cavity", it's not a scintillator at all. “There should be some way to build a low-voltage/solid-state Geiger counter. I dont know what the point of this would be, I could see doing it for fun. IF something happens you will know. Most people wouldnt know what to do with the reading of a geiger counter. This is not like fallout 3 where you run away when it starts clicking and shoot up some rad-x. That forum is a good site in general if you are interested in nuclear and other fun stuff. Not that I’m saying not to try to help, nor that the DIY/hacking community is incapable helping, but the phrase a day late a dollar short comes to mind. I take it the product is to be used by people making decisions concerning their well being. Even a simple not safe/safe instrument needs to be accurately calibrated. How that calibration will be done is a major part of such a project. Given the implied urgency the best they can hope for is to find a project that meets all the needs, that doesn’t use obsolete components. This is fundamentally a lot more difficult than it sounds, especially if you’re trying to give an indication of “health risk” rather than just radioactivity. For example, tritium is much more radioactive than plutonium, but I’d rather be exposed to the former!